The Statesboro Hampton Inn is located just 5 minutes’ drive from Georgia Southern University. Guests will enjoy a breakfast included each morning and an outdoor pool on site. 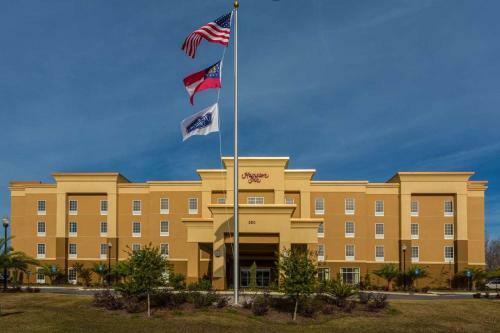 Free Wi-Fi and cable TV are available in every room of this Statesboro hotel. A microwave and refrigerator are also provided along with coffee-making facilities for added convenience. A fitness centre can be accessed by the guests of Hampton Inn Statesboro and a launderette is also available. A business centre is on site so guests can get some work done or check in with family. This hotel is adjacent to the East Georgia Regional Medical Center, 3 miles from Statesboro city centre. The Statesboro Crossing shopping centre is 5 minutes’ drive away. the hotel Hampton Inn Statesboro so we can give you detailed rates for the rooms in the desired period.